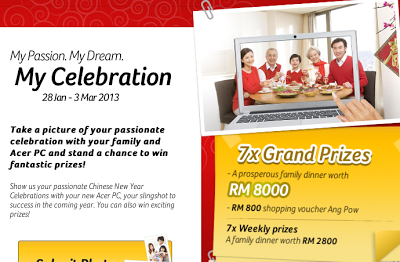 Take a picture of your family and your passionate celebration with your family and Acer PC. Submit your photo with a copy of your proof of purchase via online form, post or email. This contest is only open to customers who have purchased an Acer notebook or desktop powered by Intel® Core™-i Processors. Visit Acer FB fan page for more details.